A little over a month before GCAS, on the podcast Freakonomics, author Steven Dubner was interviewing Nobel Prize economics winner Richard Thaler in an episode titled “People aren’t Dumb. The World is Hard.” I agree. Dubner quoted Thaler: “I don’t think I’ve changed anyone’s mind in 40 years. You basically don’t change minds. Given that, I turned to the strategy of corrupting youth.” It was something, hearing the geeky septuagenarian giggle as he placed all his chips on youth. I tend to agree, and it gives me energy to go on. The first I heard of GCAS was a year ago at COP23 in Bonn, Germany. The COP (Conference of the Parties) is an annual UN event held to convene, discuss, and negotiate policy around the climate situation. COP23 was striking in that officially the United States had withdrawn from the Paris Agreement of 2015 COP21. At COP23 there was a movement called “We’re Still In,” made up of governmental leaders, business leaders, and NGOs that literally set up tents outside of the conference, and held meetings and media events. There I heard of the previously hatched idea of a summit between the 2015 and 2020 COPS that would convene in San Francisco. Having asked a question of Jerry Brown at an event, about his use of the word “existential” in regards to the climate crisis, I was able to speak with his senior aide, Aimee Barnes. She asked if I would be attending the Summit. Seed planted! I wanted to be there: energy to go on. The Global Climate Action Summit was held September 12-14. GCAS was timed midway between 2015 and 2020 to provide confidence to governments to “step up,” and to trigger the next level of addressing climate challenges sooner rather than later. The People’s Climate Movement organized world-wide marches named Rise for Climate Jobs and Justice, to raise awareness four days prior to the Summit, and to demonstrate fierce grassroots passion to global leaders. The central march was planned for San Francisco. I was on the steering committee of the NYC march held on September 6, flew to San Francisco on the 7th, and was able to participate in the march on the 8th. I carried the same banner as in NYC, “PRAYING WITH OUR FEET,” a quote from Rabbi Heschel. 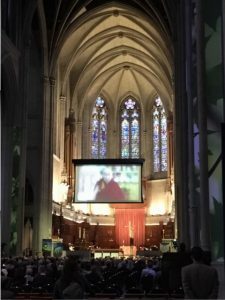 GreenFaith had hired a 28-year old organizer, Zen practitioner, and musician, who in six weeks motivated 3,000 people of faith to come and sing, dance, make banners, and be a part of painting the largest street mural in the history of the world. We will be seeing more of Kyle Lemle: energy to go on. Faith groups organized several planned actions beginning at 8:30 the morning of the march. Roughly 100 people gathered to sit outside at Bierman Park on the grass, at the beginning of the day. 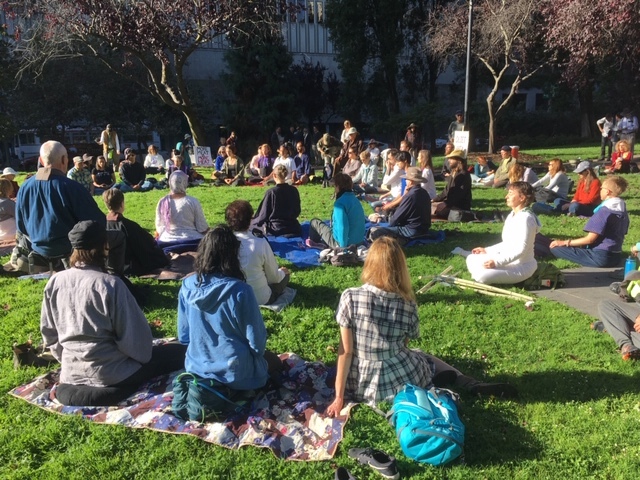 Following the sit, there was an Interfaith outdoor worship service. It was during this time that I held my Shambhala Great Eastern Sun banner. Then we walked about a quarter mile to the site of the start of the march. Our 3000, joining 27,000 others. This start of the day: energy to go on. 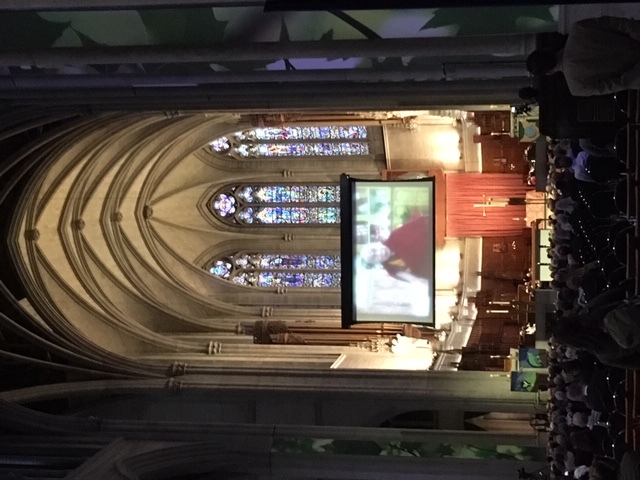 The opening event held Wednesday night in the sanctuary of Grace Cathedral was absolutely breathtaking. It began with an Ohlone ceremony celebrating the Earth, then various faiths paraded into the space. Then a combination of speakers, music (the Thrive Choir! ), videos (Dalai Lama encouraging us on! ), quotes, and sharing faith perspectives on regenerating a healthy climate. Grace Cathedral is one of San Francisco’s treasures. Sitting atop Nob Hill, it truly has the king’s (or queen’s!) view of the city. In the tradition of large European cathedrals, the inside is as awe-inspiring as the outside, with large vaulted ceilings, enormous stained glass windows, and an indoor sacred labyrinth. 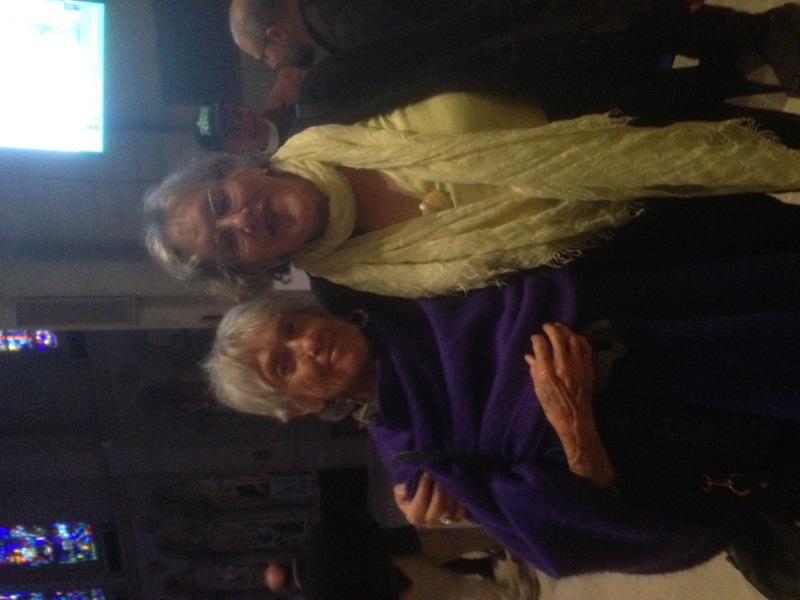 Following the service was a lovely reception in one of the side chapels, and Irene, David and I were joined by Adam Lobel–finally a convening of our Shambhala contingent! To top that off, the GreenFaith team took a ride into the Mission District for dinner at a Thai restaurant. It was David and my first in-person introduction to the playful, raucous, diverse folks who comprise the GreenFaith family! Talk about energy to go on!! One of GreenFaith’s clear objectives coming to GCAS was to present the Living the Change initiative. We presented this multifaith, sustainability lifestyle, commitment-based initiative at one of the affiliate sessions at the GCAS. Briefly introduced were the six pillars that inspire people to commit to environmental stewardship: 1) Walk the talk, people need to commit to and model behaviors. 2) Tell a story, speak from one’s experience, not in a moralistic way. 3) Create activities, provide ways for people to experience the behavior change. 4) Foster peer to peer support, ask champions in one’s community to encourage others. 5) Celebrate, make the process of changing habits fun. 6) Tie to the big picture, link the effects of the individual actions to the whole of society. GreenFaith’s Living the Change event was very successful, and it was moving for people to stand and make a commitment aloud. Earlier at the opening ceremony, Adam’s personal commitment to Living the Change had been read aloud among others as an example. He would be riding his bike and committing to putting solar panels up on his home. There were two fantastic interactive simulations offered. The role-playing Climate Justice Simulation delved into the intricacies of real situations faced by three U.S. communities in their struggles to contend with and organize around environmental injustices: industrial, indigenous, and mountaintop removal zones. The second simulation, sponsored by GreenFaith and called Climate Interactive, is a role-playing exercise of the UN climate change negotiations, using an interactive computer model to analyze the results of the mock-negotiations in real time. Participants play different countries, experiencing the climate impacts of their own and other countries’ choices. Much like in real life, this simulated global community was getting down to the wire without being able to agree on how to collectively assure no more than a 2 degree C increase in global temperature. This gave rise to a spontaneous, passionate speech to the assembled UN delegates by Irene, who was representing developed nations of Canada, Australia and South Korea. Speaking on behalf of the “women of the world” she implored these recalcitrant nations to be “more generous than they have ever been.” Her powerful voice resonates beyond the game, and becomes a living mantra. More energy to go on. Perhaps most sobering of all the events was a presentation by Cynthia Scharf, being interviewed by Fletcher Harper of GreenFaith, on the opportunities and pitfalls of geo-engineering. Geo-engineering would count on scientific discoveries around changing the earth’s atmosphere to be used, if and when we are at a precipitous time for the planet. Cynthia had to stop several times during her presentation to acknowledge her grief for the difficult choices we sentient beings have before us. The science and faith, pervading the room in the last session of the summit for us, provided a real note of gravity of the situation, energy to go on. Intermixed in all these days, I spent time talking and being silent with my dear friends Emily, David, and Adam. 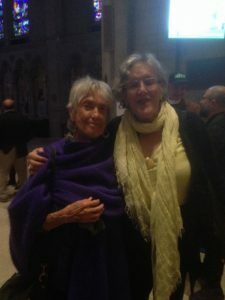 We each came to this event with the Shambhala situation quite alive and kicking, and without talking about it, we hugged and knew where we were. Some things have died, some are in hibernation, and some things, like the climate work, are sprouting seeds all over the place. In the last two months I have heard from Shambhalians, young and old, writing to me, wanting to be engaged, and engaged together. As arrows, we are on life’s adventure, that has us very out there, and it is good to have each other, sangha at this time, late at night, to be on the path with: energy to go on. The brilliance of the teachings rests in each of us. How we collaborate, convene, and build a new culture that reflects this goodness is our task and our good fortune. How do we as a community of individuals in Shambhala bring all this to our culture? We are creating a community of caring for the earth, in our words and more importantly in our actions. For many years this group was called the Touching the Earth group, and it still is. The name feels right. Touching the Earth re-arises in this new Shambhala era, and it is open to anyone who has the desire to live in a way that is kind and wise about this earth and all its beings. Please come along and join the team of warriors, as we connect further with the earth, through the tradition of drala. We commit to examining and aligning our lifestyles with the needs of the earth. With the help of Livingthechange.net we can transform our homes and centers, and as we do we spread our energy to go on, with others, so they too may have energy to go on. Do what you are spurred to do in your own life, at your center, AND write to us! Send your rsvps (email address) to this ongoing work/party of Touching the Earth to David at [email protected]. We will convene via the internet, online.